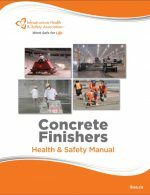 IHSA has recently published a new health and safety manual for Concrete Finishers! This manual covers all aspects of concrete floor health and safety which makes it a great tool for new workers! Please click here to download the PDF. Please see our CFLRA Work Safe Bulletins for more information on cement burns, carbon monoxide poisoning, isocyanates and more.